NASHVILLE – Pathway Women’s Business Center was excited to receive recognition at this month’s 2018 NEXT Awards + Entrepreneurs Hall of Fame, held November 7, 2018 at Rocketown through the Nashville Entrepreneur Center. Pathway WBC director Courtenay Rogers accepted the award for Navigation Partner on behalf of the center and gave some follow-up remarks to the Entrepreneur Center team. The Navigation Partner of the Year represents an organization that has been instrumental in the support and development of the EC’s Navigation resource in its first year, which aims to help entrepreneurs efficiently connect to the best-fitting resource for them in Nashville. In addition to Pathway WBC, additional entrepreneurial resources offered through the EC include Nashville SCORE, Conexion Americas, and the Center for Nonprofit Management. The 2018 NEXT Awards celebrated the rebels, visionaries, and game changers who have made a significant impact on the economy in Middle Tennessee. All stages of companies, from emerging startups to well-established market movers, were celebrated by over 500 attendees as contributors to making Nashville one of the best cities in the U.S. to start a business. 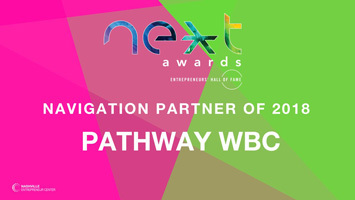 At Pathway WBC, we’re grateful to have been recognized at the Next Awards this year and excited to continue working with the Entrepreneur Center as a resource for Nashville business owners. To learn more about the winners of this year’s Next Awards, visit www.ec.co/nextawards.